OKLAHOMA CITY (AP) The third quarter has often been a problem for the Oklahoma City Thunder this season, but that’s when they made their move Monday night against the Sacramento Kings. Oklahoma City was up 91-77 with 2:51 left before official Matt Boland called two quick technical fouls on Westbrook after he complained about being called for traveling on a play on which he thought he’d been fouled. Another official, Gediminas Petraitis, then called a technical foul on Thunder coach Billy Donovan for protesting Westbrook’s ejection. Hield made all three technical free throws and Cauley-Stein went 1 of 2 from the line with 2:35 left, pulling Sacramento to 91-84. But the Kings made only one field goal the rest of the way, and George blocked a shot and came up with a steal in the final two minutes. 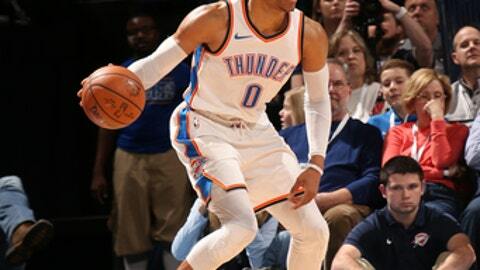 The Thunder seized control with an 11-0 run in the third quarter, highlighted by consecutive alley-oop passes from Westbrook for dunks – first to Anthony, then to Adams. Anthony’s two free throws put Oklahoma City ahead 75-66 with 1:39 left in the quarter. After the teams went scoreless for the first three-plus minutes of the fourth, Sacramento pulled within seven on a basket by Cauley-Stein, but Patrick Patterson hit two 3-pointers in a 17-second span and Alex Abrines followed with another to extend the Thunder’s lead to 86-70. Kings: Hield traveled back to Norman on Sunday to visit practice at No. 4 Oklahoma. Hield led the Sooners to the 2016 Final Four. … The Kings, who beat the Thunder on Nov. 7 in Sacramento, haven’t won two straight over the Oklahoma City franchise since the 2007-08 season, when the team was in Seattle. … The Kings made 15 of 25 free throws, while the Thunder went 14 of 29 from the line. Thunder: Ace defender Andre Roberson sat out for the eighth straight game with patellar tendinitis in his left knee. … For the 14th straight game, Westbrook recorded a double-double with at least 20 points. The only guard in NBA history to have a longer such streak was Michael Jordan, with 15 straight in 1989. … George, the NBA steals leader, had five. … Westbrook’s 16 rebounds were three off his career high. … At halftime, the team showed a video with Thunder players reciting excerpts from Martin Luther King Jr.’s famed ”I Have A Dream” speech. With Oklahoma City up by 14 and the game seemingly under control, Westbrook looked to finish it off with a driving layup, but collided with Cauley-Stein as De’Aaron Fox appeared to hit Westbrook in the face. Boland ruled that Westbrook had traveled, setting off the slew of technical fouls. Westbrook didn’t stick around to answer questions after the game, but Donovan said Petraitis later apologized to him for calling the technical foul on the coach.